When it comes to safety, tree stand harnesses are a real necessity for hunters who prefer to shoot from up high. Unfortunately, too many hunters do climb their tree stands and make their shots without the proper safety gear. While it is not a legal requirement to wear a safety harness in a tree stand, it is a good idea to protect yourself from accidental falls. Instead of risking your life without good safety gear, it is easy to add the best tree stand harness to your collection of hunting gear. 4.1 1. 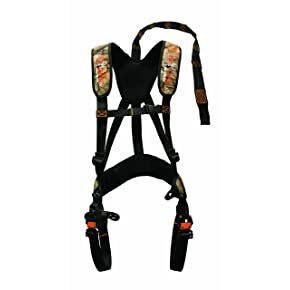 The Hunter Safety System Bowhunter Harness is a good choice for all types of tree stands. 4.2 2. The Big Game EZ-On Basic Safety Harness is another lightweight safety harness that is recommended for tree stands. 4.3 3. The Tree Spider Speed Harness gives you the flexibility to get up and down the tree quickly and safely. 4.4 4. The Gorilla Gear G-TAC Ghost Mossy Oak Hunter Safety Vest provides tree stand safety as well as some convenient pockets. 4.5 5. If you prefer the look and feel of a safety vest, the Leader Accessories Full Body Hunter Safety Vest is a good option for tree stand safety. 5.1 1. The Hunter Safety System Rope-Style Tree Strap is a tool that you should use regularly. 5.2 2. The Primos Pull-Up Rope adds a secondary level of safety to your treetop hunting. Learning how to properly use a tree stand harness is the best way to stay safe when hunting from up high. Tree stand harnesses come with informative manuals that make it easy to put on the harness, to attach it to the tree stand. When you wear your harness, it isn’t enough to just put it on, the straps need to be properly tightened to keep you safe. Falling from a tree can result in death or paralysis. It is amazing to consider that you can save your own life by simply putting on a lightweight, affordable harness. Unfortunately, injuries resulting from tree-stand falls are the most common causes of injuries during hunting seasons. In fact, one-third of all hunters who shoot from tree stands are injured due to falls. Fortunately, there are plenty of ways to stay safe in the tree stand by using the best tree stand harness. The first, and most important tip is to only climb a tree and enter a stand while wearing a tree stand harness. It is also important to only use healthy trees for your tree stands. It is also vital that the tree is the correct size for the stand you are using. 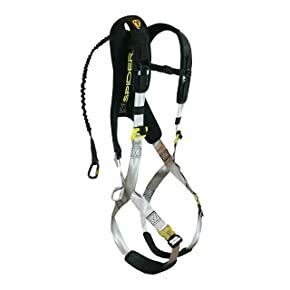 Along with using a tree stand harness, it is highly recommended that you use a safety strap to connect your harness to the tree; no more than 12-inches of slack should be allowed. You should always be aware of the state of your body in the tree and the quality of your harness. To maintain safety in the tree stand, it is also a good idea to safely bring your gear up the tree. Your bow and/or firearm should be unloaded and you should never climb up or down the tree with anything in your hands. To remain your safe, it is helpful to let someone know exactly where you are in the woods and it is best to hunt with a partner. There is a general rule of thumb about having three points of connection while you climb up and down the tree. Along with the harness, you should have a combination of hands and feet always on the ladder or on the tree as you climb up and down. The type of tree stand you use can be a determining factor in the type of safety harness you choose to purchase. The lock-on stand is a lightweight stand that has a small profile and can be difficult to put in a tree. In order to remain safe at all times with this type of tree stand, it is helpful to use a tree stand harness along with a tree strap and a lineman’s rope. The lineman’s rope is used to let your work from the trunk of the tree. With the harness and the rope, you can use your arms to set up the tree stand. It is helpful to put a tree strap around the trunk at the spot where you plan to sit. If you use a climbing tree stand, you will also want to have lineman’s rope and a tree strap. As you climb the tree, you will also be installing the tree stand. The tree strap will be used to help you stay close to the trunk and to help add a safe line that lets you move up and down the tree safely. As you move up the tree, you can use knots in the safe line to help you find a spot to sit. Using prusik knots, you can attach a carabiner to help with movement up and down the tree. Lastly, box blinds often do not have any place to attach a harness. These are the ones that most people fall from, because they appear to be safe but are often misleading. You can make a box blind safe by attaching your harness to the tree itself using a tree strap placed above your tree stand. This video will show you how to safely use a tree stand harness. 1. The Hunter Safety System Bowhunter Harness is a good choice for all types of tree stands. This tree stand harness fully encompasses the idea of being a safe hunter. It is a lightweight harness that uses a commonly found camouflage pattern to blend in with the surroundings. The harness has padded shoulder and back straps along with leg straps that are free of dangling straps. The buckles and rest of the harness are easy to understand. The harness weighs in at 2.5 pounds, which is barely noticeable on hunters who are covered in their cold-weather gear. The harness can be worn in any environment because it is so light and easy to wear. It comes with several accessories including an informative DVD, instructions, a relief strap, and a primary tree strap. The harness does come with a long-lasting five-year warranty. 2. The Big Game EZ-On Basic Safety Harness is another lightweight safety harness that is recommended for tree stands. This one also comes in an attractive camo fabric. 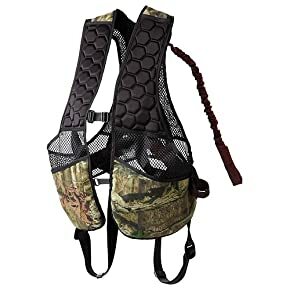 It has a built-in deer drag and the harness weighs only two pounds, but can hold up to 300 pounds from falling out of a tree stand. This harness is better than the ones that come standard with tree stands, especially with the quality of the leg buckles. On the Big Game EZ-On, the leg buckles are designed to get on and off quickly. The attached vest is also comfortable, with just the right amount of padding. It includes a tether and a lineman’s strap to help provide some suspension if you fall out of the tree. The only thing that needs to be changed is the color of the buttons on the leg buckles; they are red, which stands out against the green and brown of the trees. Red buttons on the leg straps should be colored black. Sizes are not exactly as described – the sizes run larger than expected. 3. The Tree Spider Speed Harness gives you the flexibility to get up and down the tree quickly and safely. This harness includes a speed clips integration system that lets the device attach to any S-clip so you can easily move around the tree. It includes a specially designed X-Web Fit so the harness moves with you, rather than lessening your movement in the tree stand. You can wear the tree stand harness under your clothes or on the outside of your clothes. The harness includes three custom CNC machined buckles, with two on the legs and one on the chest. These buckles exceed the standards established by ANSI. Along with the comfortable mesh panels on the back of the harness, the shoulder strap and leg straps are easy to adjust. The shoulder strap and back piece have light padding to provide subtle cushioning if you do happen to fall from the tree. The Tree Spider Harness also includes a tether strap and loops to aid in vertical climbing. The harness holds between 115 and 300 pounds. For safety purposes, the harness strap measures 2.5 feet in length. The harness is comfortable on the shoulders. The harness feels like a quality piece of gear. Lightweight harness that allows for full range of movement. 4. The Gorilla Gear G-TAC Ghost Mossy Oak Hunter Safety Vest provides tree stand safety as well as some convenient pockets. This affordably priced safety vest is made of lightweight mesh with breathability. It has a three-point fit that can be fully customized. The vest includes a tether that gives the wearer full mobility. The shoulder pads are lightly padded so your chest and back can be cushioned in case of a fall. This is one of a few safety harnesses that actually comes with pockets you can carry some small items up into the tree with you. The integrated suspension system is designed to keep you safely off of the ground while absorbing the shock of stopping in mid-air. The G-TAC vest also includes a tree strap and a lineman’s belt to help you get into your favorite tree stand safely. This vest fits hunters who weigh between 140 and 300 pounds. Vest is comfortable, especially the padded recoil shoulder straps. Better than the harnesses that come standard with tree stands. Thigh sections can loosen while wearing them. The tree safety strap could be improved for strength and quality. 5. If you prefer the look and feel of a safety vest, the Leader Accessories Full Body Hunter Safety Vest is a good option for tree stand safety. This safety vest is made of durable cotton and polyester with the REALTREE camo print. It holds hunters that weigh between 140 and 300 pounds. It is one of the easiest safety harnesses to put on a take off because of the heavy duty strap that is placed inside of the quiet vest. The single buckle in the front and the seat-belt leg buckles add to the ease of wearing the vest. With the tether system, the force of a fall is reduced by about 40%. The vest has two deep pockets and the set comes with a tree strap and a lineman’s climbing rope. 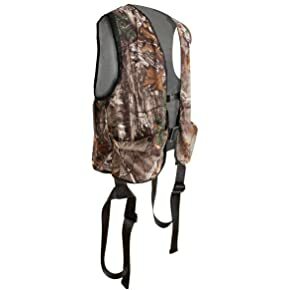 This vest is perfect to wear when using climbing tree stands, traditional tree stands, and ladder tree stands. Product is a standard safety harness with a vest over it. Vest is lightweight material that will not add safety. The web harness provides the safety, vest provides pockets. No quick-release features to get out of a fall. Leg loops can restrict movement. Along with wearing a safety harness that is attached to the tree stand, it is also helpful to use a tree strap support for added safety. This simple product uses a carabiner and long rope that wraps around the tree. If something happens to your tree stand, you will stay safely attached to the tree with the tree strap support. It is important that you be as safe as possible while hanging out in a tree as you wait for your target to saunter by you. 1. The Hunter Safety System Rope-Style Tree Strap is a tool that you should use regularly. This basic tree strap includes a strong rope with an equally strong carabiner. This strap is significantly better than the ones included in tree stand or safety harness kits. 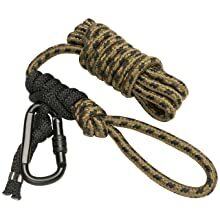 You use this rope-style tree strap to climb up and down the tree stand, so you can stay permanently attached during the dangerous transitions. The strap provides complete mobility in nearly every type of tree stand. In most cases, you will have 360º of shooting views. All you have to do is loop the rope around the tree above the stand. Can hold up to 1000 pound. Short length is not appropriate for large trees. Too short for long trees. 2. The Primos Pull-Up Rope adds a secondary level of safety to your treetop hunting. This rope is ideal for raising and lowering your gear to your treestand. The rope has a ⅜-inch diameter and is 30 feet long. 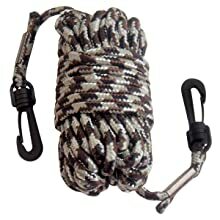 It is a durable, nylon rope in a camo pattern. It has snap hooks made of plastic that can easily be attached to your gear. The rope is light weight, but strong enough to lift your gear. The rope is designed to not tangle, which is helpful when you are working hard in the limited light of hunting season. The hooks are snuggly attached and held in place with metal clips. Long rope with hooks attached at both ends. The plastic clips can break. Tree stand safety is a life-or-death matter. There is absolutely no guarantee that you will safely remain in a tree stand for the duration of any hunting expedition. This is why it is so important to choose the best tree stand harness. For affordable prices, you can easily add a comfortable and flexible tree stand harness to your hunting gear. Along with a quality safety harness, it is a good idea to have a secondary piece of safety equipment by using a tree strap. 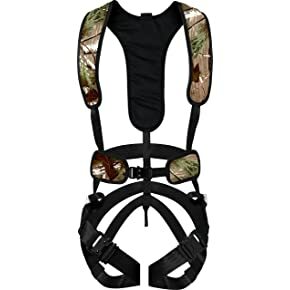 The best tree stand harness provides comfortable padding around the upper body as well as strong and secure leg straps. The harness should not restrict your mobility in the tree stand. It should be so comfortable that you could actually take a nap in your tree stand while you wait for a deer to wander past you. Nice article. I like that your blog is entirely about hunting, camping, and survival. Adventurous people like me will surely enjoy reading this blog regularly. Yes, I’ll be referring to this article whenever I need a tree stand harness. Right now, I’m not really serious about hunting. I’m just doing it for casual fun.